I've always loved the ordinary yellow Verbascums I've seen in pictures of English gardens - like foxgloves, they make beautiful vertical accents, especially in perennial and mixed borders. So when a rogue Verbascum 'arrived' on the edge of my water race, it was given a grand Moosey welcome. My beloved Gunnera arrived this way a few years earlier. I let the first Verbascum keep growing. Naturally it had to winter over before flowering, which it did beautifully - the big leaves are silvery-green and quite fluffy. Now after a few years I have quite a colony of Verbascums - some flowering, and some juveniles ready to spring into action for the following season. The verbascums, commonly known as mulleins, are all growing in the one garden area - the Dog-Path Garden, near the water race. I may start to shift seedlings into other areas soon - I hope I won't live to regret this! 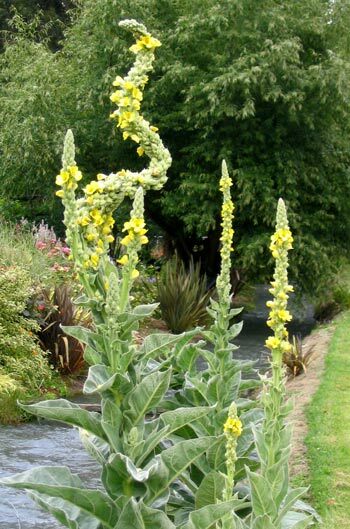 Plants (and weeds) that are spread by water can be a menace, and I feel a tinge of guilt allowing the Verbascums to grow on the side of a waterway. Then I rationalise that someone else started it! Oops - that's not a very responsible environmental attitude! For some reason - possibly the wind - this year's Verbascums have grown rather curly flower-heads, and they look rather silly. I love them, and hope that like my beloved foxgloves they continue to behave. Just enough seedlings for next year, thank you - please don't get too invasive! 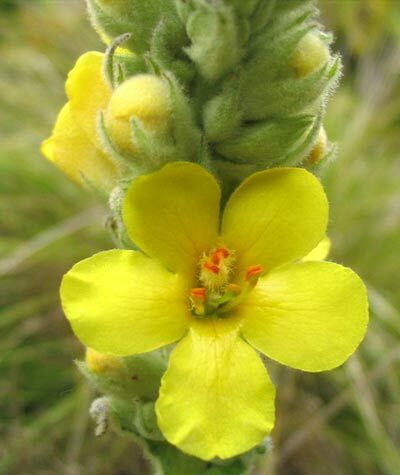 Verbascums are biennials - the first year they form large fluffy silver rosettes, then the following summer the flowering stems appear with their little yellow flowers. Some gardeners will find these original Verbascums far too weedy. I have tried to grow the fancier hybrids - one called Helen Johnson comes to mind. The hybrids I've tried have had unusual and exciting colours, but all have been short-lived in my garden. As far as flower colour goes, these yellow Verbascums appear at the perfect time - the early Moosey summer garden is green and rosy, and the soft yellow provides good colour contrast.